A Model's Top Five Tips on Posing for Instagram Photos - inspo + co. I get messages all the time asking how I act so natural in front of the camera. I’ve always LOVED getting my photo taken, but I know that many people say they HATE being photographed. 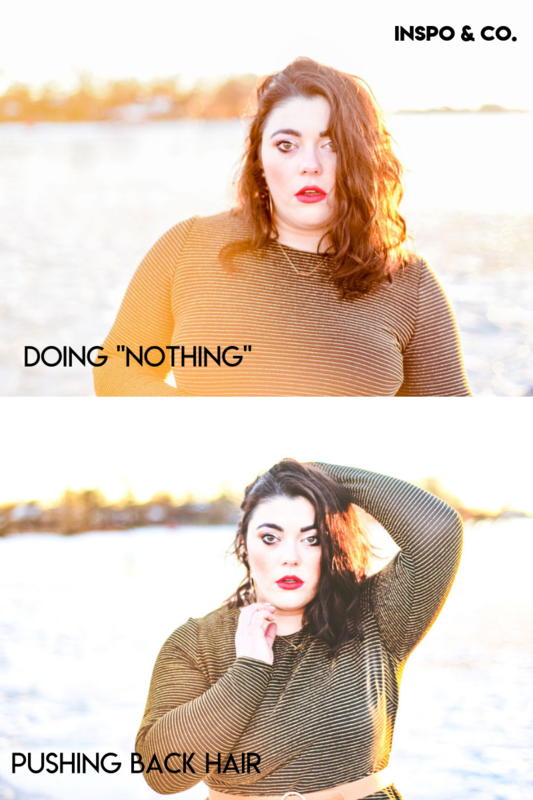 Learning how to be comfortable in photos is one thing, but actively modeling for a photoshoot or Instagram content is an entirely different talent. 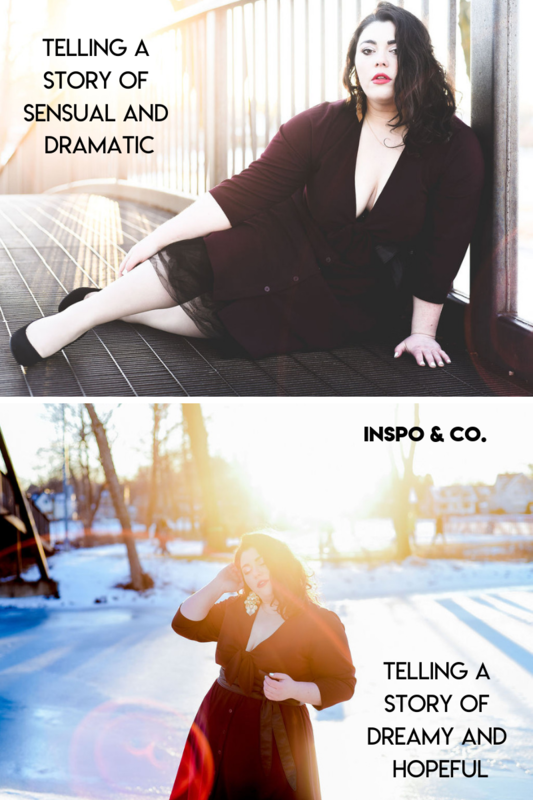 I was lucky enough to attend a modeling workshop at last year’s Curvy Con during New York Fashion Week and got great pointers from big names in the current plus-size modeling industry. Working their advice into my photo sessions has really helped me become a more fluid model and inspired me to be more adventurous in my posing. I still take photos where I think I look unattractive, there are many outtakes everytime I shoot that I don’t use and there is always room to learn more about actively working my body’s best angles and features. So, don’t feel alone if you are not a huge fan of yourself in photos. It happens to the very best of us! Also – there is more to life than looking like what popular culture has taught us is “attractive” in photographs. Sometimes your double chin may be on display, a crazy angle can be “unflattering”, or your “imperfections” are shining – WHO CARES? 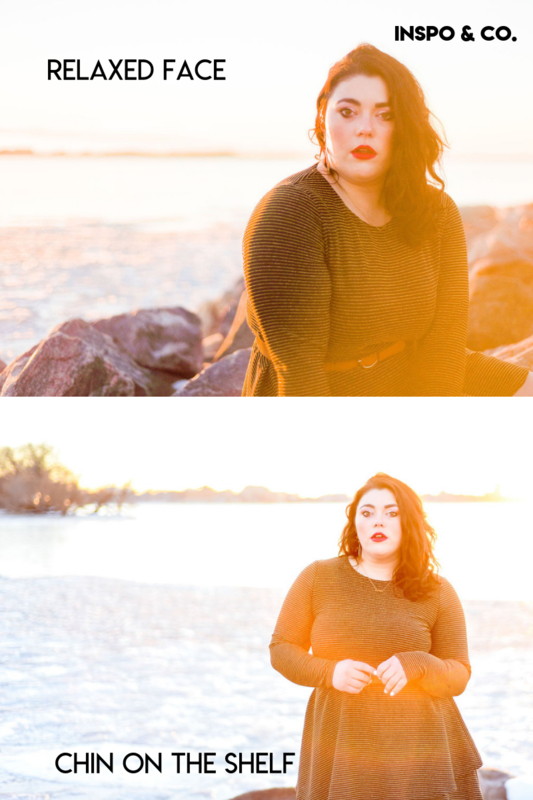 Post photos that make you happy and document your body at any size and in any way….because all bodies are beautiful. 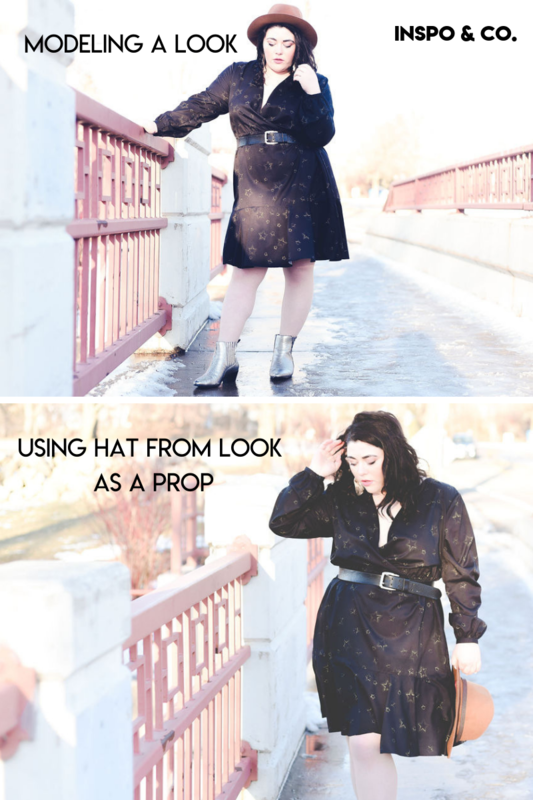 That being said – I do have some tips and tricks that you can use to get more camera comfortable and up your current photograph game to Insta-worthy – if that’s what you are going for! 1) Practice having “something to do” in your photos. It can be normal to naturally stand straight on like a deer in the headlights as soon as a camera comes out. There is nothing that can ruin an Instagram photo quicker because the final shots will look uncomfortable and hokey. To combat just standing with a smile on your face – find something to do as your photographer shoots. Maybe you play with the hem of your dress, zip up your coat, pretend to call someone on your phone, straighten your earring, reach like you are going to pick a flower or brush away some snowflakes. Focusing your attention on another task can help your facial expressions naturally soften and can help your body loosen up. Any time I take a photo for someone else and they seem uncomfortable – I always suggest a small task for them to do and then start clicking away as they do it. It makes a marked difference in the comfort level captured in the final photos. 2) Work with a prop if it helps. If finding something to “do” in the photo is proving to be hard, turn to props as a saving grace. A can of soda, coffee cup, single flower, purse, newspaper/magazine, your phone, sunglasses – these can all be used to focus your attention on and bring an element of storytelling to your photos. Be creative and find innovative things to make your shots seem like a slice of your day and not a posed process. This also can be a way for you to connect with your environment instead of just existing in it. Don’t just sit at the cafe table, pick up your latte and take a sip. Use props to convey that you belong in the space naturally. 3) Don’t be afraid to slowly move through poses. The days of standing in one place and smiling are OVER. Movement is in baby! This is more of an editorial fashion tip and may not be appropriate for your average family photo – but will works so well for Instagrammers and Style Bloggers. This tip was a big concept covered in the NYC workshop. Every model there said that slowly moving around the set while the photographer snapped away was key to getting high-quality, editorial-looking photos. It sounds kinda strange if you are just standing against a random wall downtown…but it really works. Pretend you are dancing slowly to your fave song in your head, walk forward and then back again while still facing the camera, twirl around slowly, swing your purse from an arm. 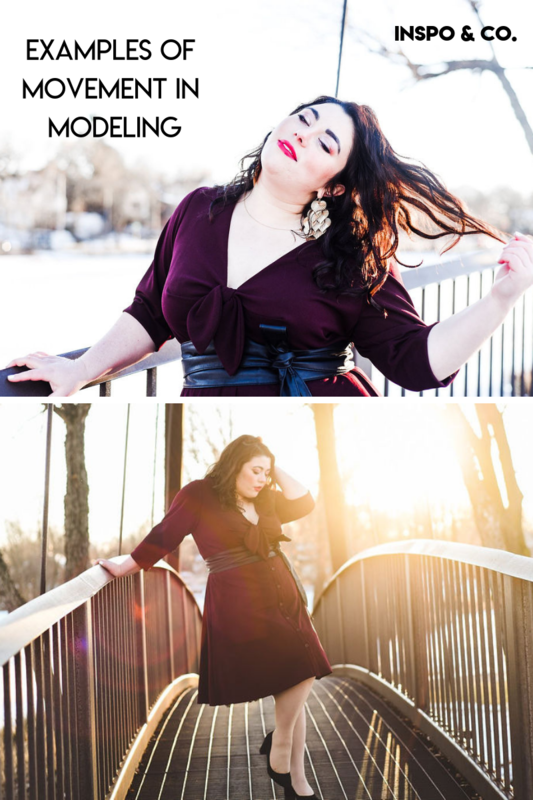 Bring movement into your modeling and it will change your final photos in a big way. 4) Learn how to “set your chin on the shelf”. If you are working on how to hold your body and showcase your best features on camera – this tip can be very helpful. Pretend that you are standing in front of a shelf that’s a little above chin-level. When you model, work on actively pulling up through your core and stretching to set your chin right on that shelf. It helps to elongate the body and tone up your muscles. Another little tip to do this correctly is to actively press your tongue against the roof of your mouth. It helps to avoid double-chin (if that’s what you are going for) and activates your face muscles. This can take some practice, so get in front of a mirror and give it a go! 5) Tell a story with your presence. Not every pose has to be of your smiling face! Maybe you are open-mouth laughing in a shot, looking confused, have your eyes closed, seem angry/sassy. Netflix has done extensive testing on what promotional images are clicked on most for the thumbnails of their content. They have found that faces expressing wild emotions (scared, very happy, silly, strange) do extremely well over other image options for the same program. Where are you going in the outfit you styled? How are you really feeling that day? How do you want people to feel when they look at the photo you are going to publish? I hope these tips can help you up your modeling game! Being comfortable in front of the camera can take some time so be kind to yourself and open to exploring what works best for you. Grab a friend or even set your phone up on a self-timer and start practising. Post photos even if you think you “don’t look good”. Let yourself be seen. You are beautiful. If you want more advice – sign up for my mailing list in the sidebar on the right. My monthly newsletter is packed full of fun Inspo for all areas of your life! How exciting that you learned all this during Fashion Week! Thanks for sharing, photos are beautiful!